Despite clocking 9 per cent revenue growth in constant currency terms for FY19 against its guided range of 6.5-8.5 per cent for the period, the country’s second-largest information technology services company guided for only 7.5-9.5 per cent revenue growth in FY20. Similarly, its operating margin forecast of 21-23 per cent was one percentage point below FY19’s guidance of 22-24 per cent. This is for a second year in a row when the Bengaluru-headquartered firm has reduced its margin forecast. In the fourth quarter of FY18, the firm met Street estimates on the revenue and net profit fronts, while margin came below market expectations. Net profit of the company rose 10.5 per cent to Rs 4,078 crore year-on-year, while it grew 12.9 per cent sequentially. However, for the whole year, net profit declined by around 4 per cent to Rs 15,410 crore owing to increased operating expenses, apart from the reduction in value of assets held for sale. The IT firm, whose earnings announcement coincided for the first time with that of TCS, posted a 19.1 per cent jump in revenue at Rs 21,539 crore for the fourth quarter. While revenue growth in constant currency terms was around 0.6 per cent on a sequential basis, it was 2.4 per cent in dollar terms. 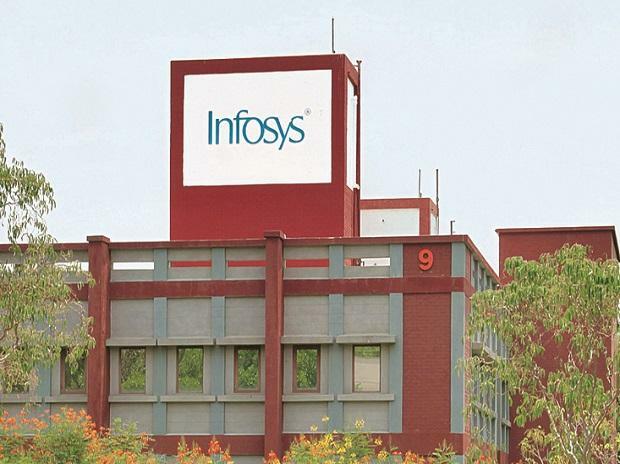 For the whole year, Infosys reported 17.2 per cent y-o-y growth in revenue at Rs 82,675 crore. Revenues grew 9 per cent in constant currency terms, while in dollar terms, growth was 7.9 per cent. While the firm showed good momentum in revenue growth by signing large deals worth $6.28 billion for the whole fiscal, operating margin took a big hit in the fourth quarter. Q4 margins came at 21.5 per cent, which was well below the company’s guided range of 22-24 per cent. For FY19, margins stood at 22.8 per cent, which was at the lower end of its guided range. Among verticals, Infosys witnessed negative sequential growth in financial services, retail and life sciences during the fourth quarter. However, it posted strong growth of 16.8 per cent in communication and hi-tech verticals. “If you look at banking alone, we had a positive growth rate. But, negative growth was in the insurance sector, which brought the entire growth down. Also, on a YoY basis, financial services did well. Infosys’ ADRs (American Depositary Receipts) were trading 2.69 per cent lower at $10.67 at Nasdaq at the time of going to press. Even out of the 13 large deals, which we had this quarter, three were from financial services,” Parekh said. During the last fiscal year, attrition continued to remain a matter of concern for the company. For the quarter ended March 2019, overall attrition remained at 20.4 per cent, a rise of 50 basis points over the preceding quarter. “Overall attrition remains high and we are continuing our focus on arresting the same,” said Pravin Rao, chief operating officer, Infosys. The total headcount by the end of the March quarter stood at 228,123, an addition of 2,622 employees over the previous quarter.